When the cat’s away it seems the rats do come out and play. During my brief sojourn up to Loxton this week I missed all the excitement. What a time not to be here. 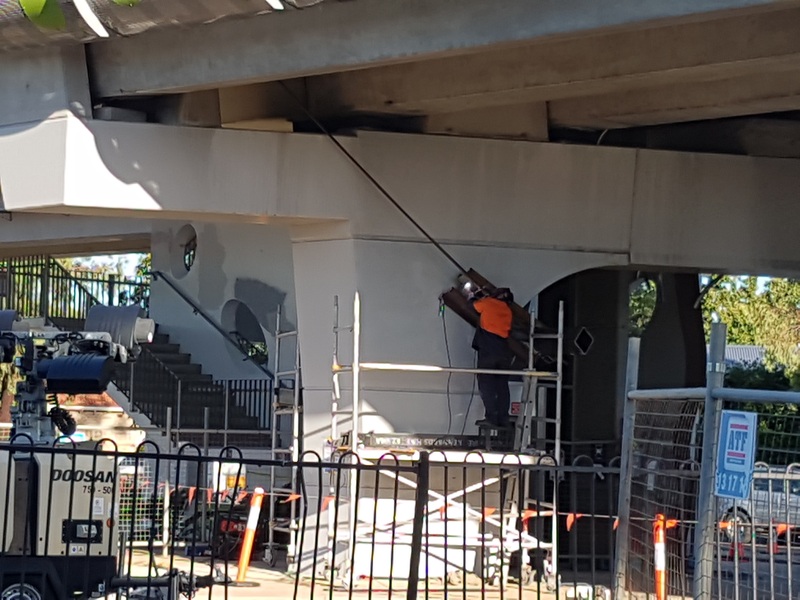 Storm activity disrupted power supply and the discovery of structural concerns on the tram overpass over South Road has been high at all media outlets. The storms disrupted power to residents of Clarence Park, including ourselves. This was the fortunate part of being away. The blackout that hit 112 homes did not impact on my wife and I. Well apart from a fridge and freezer full of food that had to be thrown away. I missed also the disruption caused to traffic using South Road. The Government, through DPTI, undertook an unscheduled inspection and repair of the tram overpass. Everyone by now is aware that one of 5 beams is leaning out. Temporary bracing repairs are well under way as I draft this question without notice. It looks like disruption to commuter traffic and to our local residents and businesses will soon be over, temporarily of course. When the time comes to effect a permanent solution traffic disruptions will be the order of the day again. Who knows for how long on that occasion. I will be asking Council’s administration a question without notice at our next Coucnil meeting on Monday night. 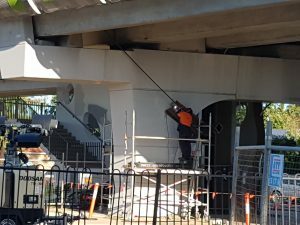 It concerns the future disruption to commuters and therefore the residents and businesses of Unley when permanent repairs or rebuild occurs. What will Council’s administration be doing to assist or direct DPTI in managing the diversion of traffic and in particular heavy vehicles through our streets to minimise inconvenience to residents and businesses alike. Can we not only take a proactive role in determining with DPTI the least inconvenient detours but request also DPTI to alert residents and businesses alike by letter box drop or other such communication or do so ourselves as a service to the Black Forest, Everard Park, Clarence Park, Millswood and Forestville communities. Can I ask everyone who reads this blog (or the Facebook link to this blog) to support the Black Forest Shopping Centre businesses who have suffered more than we residents with a savage hit to their hip pocket. As I have indicated to most people over the weekend who received a letter last week from Council that the content in the letter was not as I, nor our CEO had expected. In error we informed we would be doing the proposed art rather than seeking your input into the design and locations. As my blog title indicates I am here to represent you and advocate for you, which is exactly what I have done to right the confusion that the letter has created. I have spoken with our CEO and he has re-affirmed that we will be listening to what you, my neighbours, have to say. He promised me on Saturday to prepare a letter apologizing for the confusion and seeking to clarify what we are seeking with you to achieve. I expect a letter may be mailed out tomorrow so watch your letter boxes. Indeed, if I understand correctly, he has already received enough feedback on the Canterbury Terrace regrowth tree sculpture to meet his promise not to proceed with it if this is what you want. Not sure if has received many yet on the Cowper Road art. Depending on what might come in on Cowper I believe we will likely formally seek input in November after the end of the caretaker mode caused by the elections. Seems the original letter should not have gone out under the caretaker provisions as our administration are not permitted to conduct a public consultation during this period. Really. Conducting my business, even with all the red tape I am exposed to pales when compared to the red tape council has to endure. It (the red tape) is one of the contributing factors behind some of the mistakes we (as an organisation) make from time to time. Watch out for his letter for confirmation of what he is offering. Admin have just confirmed the much awaited tree replacement along Canterbury Terrace Black Forest and Parker Terrace Clarence Park is scheduled for the next few weeks. 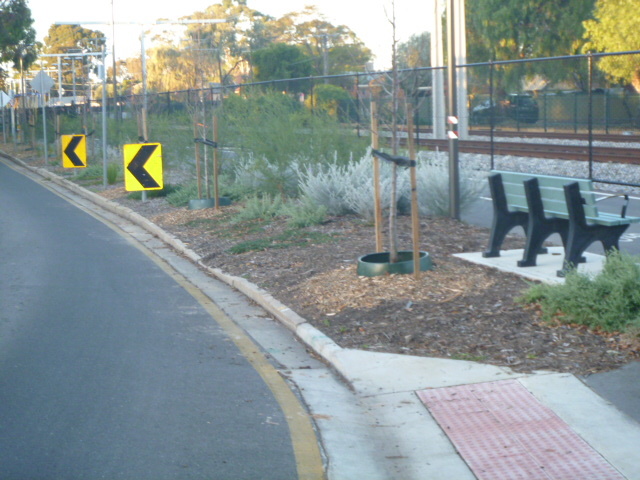 It has been determined that the same tree will be used on both sides of the rail corridor. 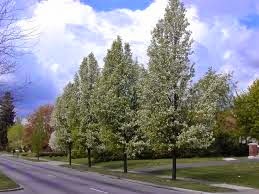 It is the Pyrus calleryana ‘Chanticleer’ as per the picture below. I have been advised that these trees will be 3.0 m high when planted which is fantastic news. There will also be low level vegetation. 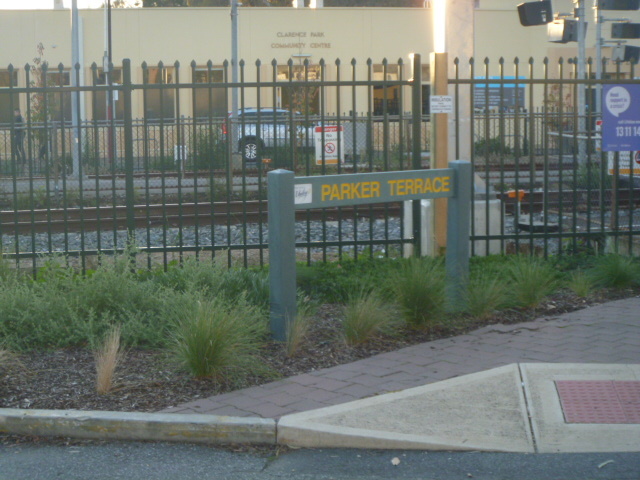 The trees in Parker Terrace will located such that we will create more carparks than there used to be with bollards located to protect the trees. This will result in paving repairs being undertaken along Parker as well. As I expect you already aware there will be no footpath and bike path along the fence of the rail corridor in Canterbury. I understand the trees in Canterbury will be planted opposite those in Parker. With our staff unable or unwilling to offer a program beyond the just recently approved budget for footpath replacement I conducted my own audit just to see how many streets are left in Goodwood South. And ….. my very own Kelvin Avenue in Clarence Park. 12 streets left and four years to complete. If at the rate of this coming years budget, maybe we will see them complete in 3 years. After our recent ward briefing last week our Administration has prepared this schedule of works resulting from the recent Black Forest LATM consultation survey. In the chart WB refers to Ward Briefing. As you will see Jennie and I have ensured some issues, identified as low priority have been bought forward. They are all easy to implement and low cost. The bid ticket item is the one being delayed pending more information from DPTI about what they will be doing with South Road. East Avenue High (1-3 years) Pedestrian ‘Kerb Build outs’ -Concept designs are being prepared – Concept to be available by end of July/ early August – a Work Request will be issued to A&I following the concept design work. Last nights public meeting saw a twist to what may or may not “be able” to happen with future development in the south west corner of Unley. Some time back I forecast two possibilities for South Road once the State Government through DPTI how they are going to upgrade South Road.On both occasions people wondered whether I was sane. I predicted that South Road may become 6 lanes wide and on a separate occasion suggested that I had information that the suburban streets of Black Forest will be dead ended with now access or egress from them from an direction on South Road. Well we learnt last night that while DPTI have been forcing our hand and pushing for the maximum density in rezoning that the very same organisation may have plans to make any such move obsolete and/or pale into insignificance by comparison. We heard of two possible options they (DPTI) are considering for the South Road, Cross Road environment. One is to build a duplicate of the Superway at the northern end of South Road. If you have not seen this the I suggest you take a drive up there ad see for yourself. The other, and likely from what I can ascertain, is that South Road in order to accommodate the B Double traffic down Cross Road will need to be not the 6 lanes I was told I was stupid for suggesting but….wait for it…. 13 lanes. So residents of Black Forest. If you cherish your environment as you clearly do, as demonstrated after your participation in the DPA 2 consultation, start pushing the government for what their plans are so you can influence them. I believe you need to be very alert as to what your State Government is proposing for you and you need to do that now, not when it is announced. And you know they (the Government) will not consult like Council have. They will inform. DPA2-Consultation Complete-where to from here? The Public Consultation phase of DPA2 after last night’s public meeting has now completed. The question is, where to from here? The presentations were in the main well researched and well presented. The submissions had substance to them. The residents of Unley are to be congratulated on their approach to the consultation phase of the DPA. I say this particularly in light of the confusing communications from the City of Unley. The residents of this fair City have demonstrated that they can have a mature conversation about the environment in which they live. I am very proud of the residents of my ward, my neighbours, and their contribution. Over 50% of the written, and the verbal submissions came from the Goodwood South Ward. This is a group of people who have had much happen around them in the item I have been on Council. And some of that they have simply had to endure, along with criticism from the powers that be that they weer poorly behaved. Notwithstanding the confusing messages sent out by Council they too have demonstrated what consultation is all about. The State Government and their department DPTI could learn a lot from us. Here is a group of people treated by Unley as adults who responded in kind. A far cry from the communications that my neighbours have endured from the State Government in the last two years. Our staff will now prepare a report summarising the main thrusts of the public feed back. They will present this report to the Development, Strategy & Policy Committee which heard the verbal submissions last night. They (the committee) will meet on August 11 when they will consider what they have heard and admin’s report. They will make a recommendation to Council who will consider the same at the August Council meeting. This will be held on August 25th. If Council were to approve the plan as drafted it would then be presented to the Minister who will get DPTI to oversee it. I reckon his sanction in this scenario would likely be early next year. If Council, on the other hand, were to make changes to it by way of changing the borders between zones or other like initiative it would have to go back for redrafting and another round of public consultation. Likewise if Council were to say we got this wrong, that it is flawed and we have to go back and start afresh, then once again our admin would have to do just that and it again would have to go back out for public consultation. In either of these scenarios the next Council would have to deal with what is then submitted. The reason for this is this Council goes into caretaker mode at the end of August in readiness for the November elections. I expect the latter will be the case (I will certainly be pushing this way)…. but …. as always …. watch this space. At least one person in the written submission is of the belief that this is what the draft DPA means to their street and indeed the entire neighbourhood. Let me please reassure everyone, or at least put my perspective on this argument. The zoning in Clarence Park & Black Forest is currently RB350. This allows for two storey construction and each house occupying 350 m2 of land now. This zoning has been around for some 25 years or more as far as I can recollect. As we all know there is very little development that fits this profile. This is not an indication that having the ability to develop to a particular formula is not going to encourage immediate and wholesale change to an area. If you believe that this is what the current proposals will trigger you should not have purchased your current house because it was ripe back then for wholesale change, change that did not occur. The other thing we need to be conscious of is the majority of the area will be Residential, still 2 storey and down from 350 m2 to 300 m2 per house. Most of any redevelopment that will occur in this zone will be not the “developers” we all criticize as profit hungry and not concerned about what impact they make on the street. They will be the mums and dads that own the property in your street. They will be you and me. As I noted in an earlier blog post in this series the “developers” we all fear will be restricted in that they will not wait forever to purchase enough adjacent blocks to squeeze the most profit out of your street. This will severely restrict the chances of 3 storeys in the Residential Zone as the third storey is not possible until the land size exceeds 5,000 m2. They will also be restricted in the regeneration zones because of the need to purchase multiple properties and they don’t have the time to wait if they are looking to maximize profits. It is the institutions that will be in a position to make immediate impact if they have (as they do) already purchased properties on the periphery of theirs. They are the ones that have the potential too to maximize. So if you live next to an aged care complex then it is far to be concerned. If you don’t please do not panic. See it for what it is. And of course, what it is needs a lot more work as I have indicated in the remainder f this series of blog posts. The DPA has highlighted that many of us in the now RB 350 zone in Black Forest and Clarence Park thought we lived in a street where only single storey development was possible. This is not so. The development plan clearly states in clause 1 of the principles of development control for the RB 350 zone that “Development should be primarily for dwelling types of up to two storeys compatible in form ……..”. 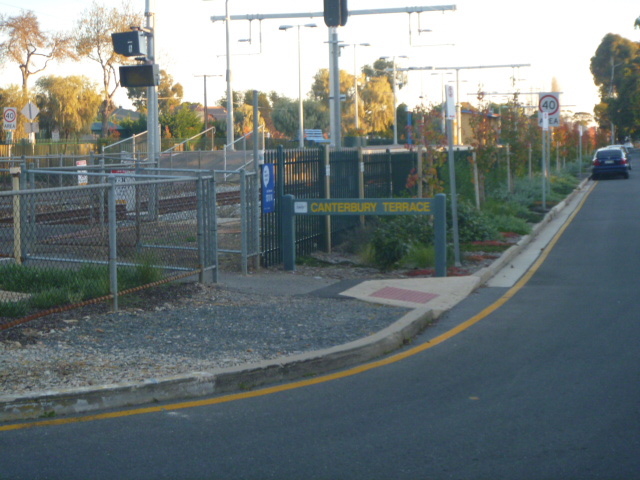 The same applies to the RB 400 zone over in the south east suburbs of the City of Unley. And this zoning has been around to the best of my knowledge for at least 25 years. This means the chances are you bought into a street capable of having your property redeveloped into two houses of 2 storey size. Indeed the form 1 that you must have served on you when buying a property will have spelt this out to you. It has not happened of course which is a clear indication that just because it is possible does not mean to say it will happen. I do direct your attention having said that to the blog post titled Immediate and Wholesale Devastation of our Streets , addressing this question.